Globe Telecom becomes the no. 1 mobile brand in the Philippines. On the strength of a remarkable company performance in 2014, Globe Telecom has established leadership in the Philippine mobile industry on multiple business fronts, making it the Number One mobile brand in the country. “Against mounting odds, we maintained a defiant and fighting stance against a long-time industry giant to achieve a phenomenal financial feat. 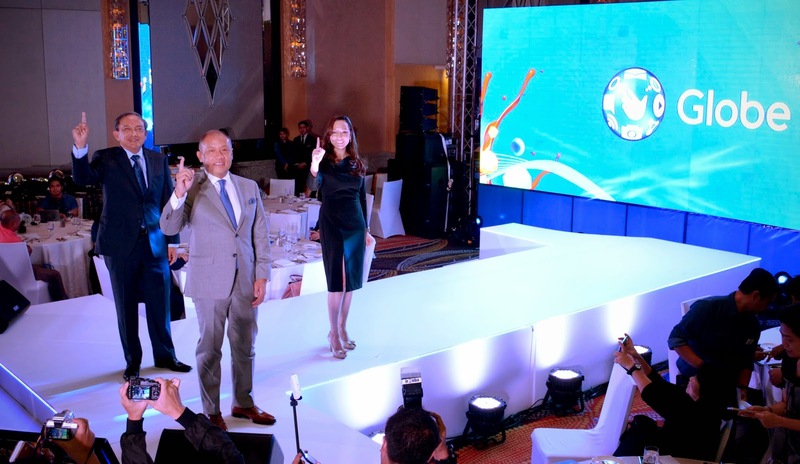 From being a challenger brand, Globe has successfully waged a revolution in all fronts, from digital, technological and business, all the way to our corporate culture as well as making our financial growth sustainable in the long run,” said Globe President & CEO Ernest Cu. As early as the fourth quarter of 2013, Globe already made significant headway in taking over the leadership position over its rival company in postpaid and mobile data businesses in terms of consolidated mobile revenue market share, continuously widening its gap as of the same period in 2014. Meanwhile, its prepaid value brand TM has reached a virtual deadlock with Sun Cellular in the same category in terms of consolidated revenue market share. The company disclosed during its Annual Stockholders’ Meeting that it achieved milestone-setting financial feats last year, bannered by a new high of P99-billion consolidated service revenues, besting the previous mark of P90.5 billion in 2013 representing a 9% year-on-year growth. It also generated in 2014 a core net profit growth of 25% to a record level of P14.5 billion and registered total consolidated earnings before interest, taxes, deductions, and amortization (EBITDA) of P39 billion, 8% higher than 2013. These were driven by the solid performance of its business segments amid sustained demand for data connectivity in its mobile and broadband businesses. During the proceedings, the company also mentioned that its share price reached a new all-time high, closing at P 2,140 per share, up 22.3% from P 1,750 at the beginning of the year. Mobile revenues, which contributed 79% of consolidated revenues, grew 7% year-on-year from the prior year’s P72.8 billion to P78.1 billion in 2014. Mobile voice revenues, which accounted for 44% of total mobile service revenues, posted a year-on-year increase of 7%. Mobile SMS, which accounted for 37% of total mobile service revenues, closed the year at P29.1 billion, 1% above from P28.8 billion of end 2013, driven by the continued popularity of bucket and unlimited promotions. Globe closed the year with a total mobile subscriber base of 44.0 million, up 14% from 38.5 million subscribers last year. Fourth quarter’s gross subscriber acquisitions registered a quarterly-high of 10.1 million subscribers, 14% higher than last quarter. In postpaid business, Globe claimed the top spot hinged on revenue market share, the new global standard for leadership claim and a reliable measure of market leadership used for telecommunications around the world. The company dominated this aspect in 2014 bolstered by P29.9 billion in revenues, as well as a 58% market share in a two-player environment, versus that of its two rivals which tallied P21.7 billion for a combined 42% revenue market share. To sustain market leadership this year, Globe continues to revolutionize the postpaid segment with the new myLifestyle Plan to enhance the digital lifestyle experience of its customers who have harnessed data and content usage on their phones starting at P499 a month, with built-in unlimited calls and texts to Globe and TM. These come with premium freebies, Globe Cloud and Gadget Care. Other variants available are Surf Packs for mobile internet browsing with Spotify and NBA League Pass bundles, Lifestyle Packs for a richer data experience through music, productivity, life, shopping and social apps, as well as Classic Packs for extra calls and texts, both local and international. In the mobile data front, Globe maintains its superior stance in the industry with revenues and data traffic growing faster than competition, powered by partnerships with global content providers such as Facebook, Viber, Spotify, NBA, and online entertainment service HOOQ, as well as better network performance to provide faster and more seamless browsing experience to enrich the Filipino digital lifestyle. The modernized Globe network also carried a higher volume of data traffic equivalent to 87,000 terabytes of data, a 270% jump from the year before because of the surge in mobile browsing and higher smartphone penetration among its customers. Mobile browsing and other data revenues generated P14.3 billion in 2014, 23% higher than the previous year. These figures were higher than competition which stood at P8.1 billion, giving Globe the upper hand in revenue market share with 64%. Sustaining its digital roadmap for 2015, Globe unveiled its partnership with HOOQ to enable access to thousands of movies and TV shows from international and local content providers. Filipinos can access over 10,000 movies and TV shows including titles from Sony, Warner Bros., ABS-CBN, GMA Network, Regal Entertainment, and Viva Communications across their computers, smartphones and tablets. The growth of the telco’s mobile data business will also draw support from the continuing network upgrade and expansion of its LTE TDD and LTE-FDD footprint. To enhance its wireless network infrastructure, Globe is activating more cell sites with the LTE-TDD and LTE-FDD ultra broadband access technologies for a more pervasive Long Term Evolution (LTE) coverage to ensure reliable and fast mobile internet service for its customers. The telco also underscored its own brand of “sustainable revolution,” driving cost and efficiencies, leading to the company’s operational excellence and optimized profitability. It also trumpeted the “cultural revolution” by Globe employees whose invaluable contributions have propelled the company to a position of leadership not only in the Philippines, but also in the rest of the world.